Tired of the same old team activities? Fuggedaboutit! 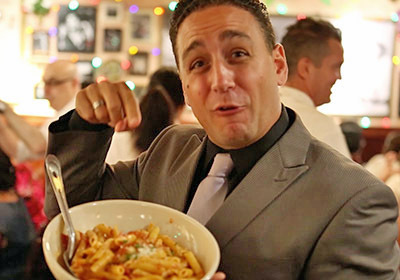 Get “made” with Buca di Beppo’s Dinner with the Mob, a Las Vegas event for corporate groups that redefines dinner and a show. The event kicks off at the Buca di Beppo Italian Restaurant where your group will be greeted by a famous mobster character making an offer you can’t refuse – a chance to meet infamous celebrity look-alikes from film and TV and bond with your own “Family”. Each team will be packing heat with an Apple iPad. After a quick training session on the SmartHunts app, the “Families” are told a hit was mistakenly taken out on a TV crime family. The mission is to find those family members and return them to the restaurant for a face to face with the Godfather. As you set out on the Vegas Strip to find these celebrity mobsters, the iPad will test your knowledge on Mob history while you use it to shoot video and take photos of famous Las Vegas sites. Keep looking over your shoulder – you never know which Mafioso may cross your path next. It could be Paulie, Tony, Uncle June or the big Mob Boss himself. And be sure they’ll have a “little job” for you, so stay on your toes. The adventure continues after the Strip when all teams head back to the Buca di Beppo for a little drink, dinner and cannoli with all of their favorite mobsters. Photos and videos from the day’s events will be presented on big screens during the festivities. The winning team will be presented with award medals, but everyone will leave with lasting memories. And don’t forget – what happens in Vegas, stays in the family! This event is also available in NYC. Email us or call 800-764-HUNT (4868) for more information. Aspects of the program may be modified depending on variables including, but not limited to, venue restrictions, program length, and group size.